There are many available programs put in place to help Cincom Smalltalk customers and partners succeed with their application development and grow their businesses. An ideas incubator that considers new opportunities as a possible start-up business and you as the entrepreneur. 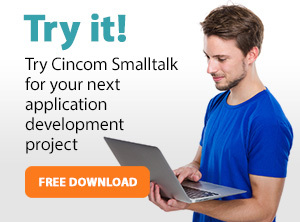 The object of the Cincom Smalltalk Developer Program is to create an environment that allows Cincom Smalltalk customers and partners to participate in the ongoing development of the Cincom Smalltalk system. The Cincom Smalltalk Partner Program is designed to develop and maintain relationships with organizations and individuals specializing in providing object oriented solutions. The Cincom Smalltalk team is extending an offer to its current users to let us assist in helping to market their applications or services. This assistance is being offered as a free service in an effort to help partners and users grow their brands and increase the usage of their Cincom Smalltalk applications.